Originally made in restaurants with a rich can of condensed mushroom soup, succulent chicken tenders, broccoli stir-fry vegetable blend, earthy mushrooms and nutty cashews, this revised version is slow cooked to get luscious full flavored entrée. Serve with cooked brown rice. RecipeSavants.com Originally made in restaurants with a rich can of condensed mushroom soup, succulent chicken tenders, broccoli stir-fry vegetable blend, earthy mushrooms and nutty cashews, this revised version is slow cooked to get luscious full flavored entrée. Serve with cooked brown rice. 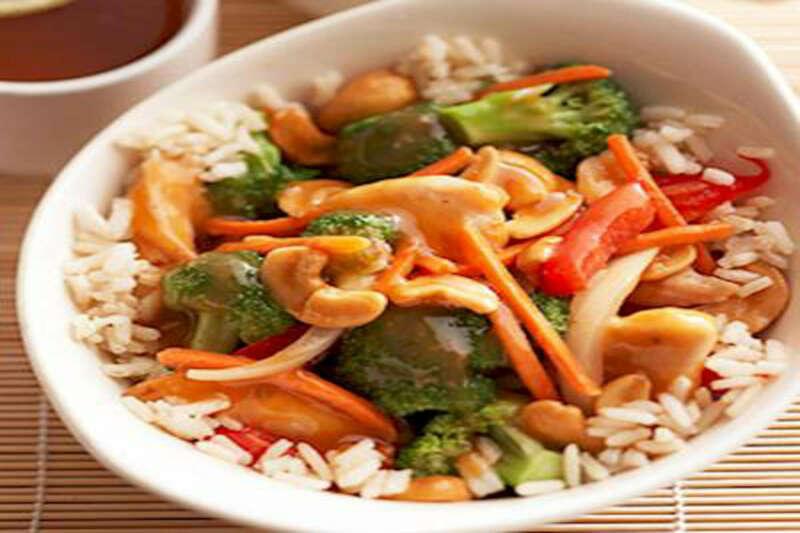 Smart Recipes, American Recipes, Chicken Recipes, Recipes Chicken American Cashew Chicken PT8H20M Serves 6 Ingredients: 10 Ounces Condensed Golden Mushroom Soup 3 Tablespoons Soy Sauce 1 Teaspoon Ground Ginger 1.5 Pounds Chicken Tenders 1 Pound Frozen Broccoli Stir-Fry Vegetable Blend 4 Ounces Sliced Mushrooms 0.5 Cup Cashews 0 Hot Cooked Brown Rice Heat a greased skillet and stir fry mushrooms and vegetable blend. In the bottom of a 3-1/2 to 4-quart slow cooker, mix together mushroom soup, ginger and soy sauce. Add chicken and mushroom mixture and stir to combine. Set the slow cooker on Low and cook, covered for about 6-8 hours. Uncover and stir cashews. Serve with cooked brown rice.